it may also ‘trim the edges’ of winners. – Conviction is our best friend. The Stockradar portfolio process has been taken to a more detailed level of analysis by testing various market capitalisation groupings and portfolio sizes. The evidence delivers steady Compound Annual Growth Rates (CAGR) throughout the portfolios and this document provides an understanding of where the portfolio service offers the best value. The data shows clear trends in the results that supports the validity and benefit of this proof of process. Traditional market guidelines such as ‘you must diversify’ derive from the point of view of perceived safety, perhaps ignorance, or an inability to have or back a sound process of evaluation and qualification. We can all get ‘scared’ when money is on the table and take the ‘perceived’ safest route, but this is perhaps the wrong approach as has been proven time and again by ‘index managers’ who suffer badly at the whims of down market periods causing unnecessary destruction of clients funds and at best average performance. A well-researched systematic price-based methodology matched with appropriate risk governance is a very safe marriage. Achieving outperforming and consistent returns has always been seen as a very difficult objective to achieve. The primary aim and undertaking when founding Stockradar was to identify, prove and deliver to the investor an easily followed systematic price-based model that would achieve superior and consistent returns. Focusing on the tangibility of price and not the vagaries of matching fundamentals to price has been the key difference. Price is what our fortunes are based on and we know prices run to excess at both high and low points of market cycles so rather than consider these prices as fundamentally ‘wrong’, we take advantage of these excesses by profiting from them. As a long only emotionally detached process we can take advantage of market excesses near the ‘fearful’ lows by buying and sell into ‘greedy’ upside excesses by selling. As Warren Buffett says, “Be fearful when others are greedy and greedy when others are fearful”. We know this to be an emotionally difficult process to follow but we also know that history tells us it is the right thing to do. The 2007 ‘greedy’ market peak and the 2009 ‘fearful’ market low are good examples of this. We kick ourselves each time we don’t respond to this easily recognisable occurrence. In 2000 I embarked on and tested a system design process which was completed in 2002, I then began the recording of trades in 2003 that are benchmarked against the opening ASX prices on Monday. I now have 16 years of credible published trade data on the Stockradar website that quantifies the initial testing and system design. The data shows that the process has performed as expected and maximised the benefit of the major high in October 2007 and that the risk management process negated to a large degree the collapse into the 2009 low. This effect continues to perform through the market cycles. The issue then became how to ‘shrink’ the 160 stocks covered by Stockradar in the initial testing into smaller more manageable sized portfolios suitable for Stockradar members. As I recorded the data finding the right balance of portfolio size and data universe on which to draw from had been an unknown quantity up to now. The initial testing of the 100-stock universe / 20-stock energiser portfolio showed great initial results with the main aim of leveraging the stock picks, which we now know work well when combined with our risk governance. I the embarked on a testing process using different data universes and portfolio sizes. This paper presents the best of these outcomes. We needed to further quantify that success. There are up and downs in the results as we know, and the data below confirms this, and I definitely don’t shirk from the reality of this, but we shouldn’t be deterred by this as any good portfolio has its ‘bumps and grinds’. The three-month period from October to December 2018 shows we must endure those unnerving periods, but we need to have confidence in a process that works. Trying to find the right stock picks to get into your portfolio at the right time and generate consistent absolute has always been the hard part but now we have a solution to this problem. The above graphic shows where we started this portfolio process with a promising equity growth and compound annual growth returns. However, it seems from evidence this has only been a starting point for progressively improved results. 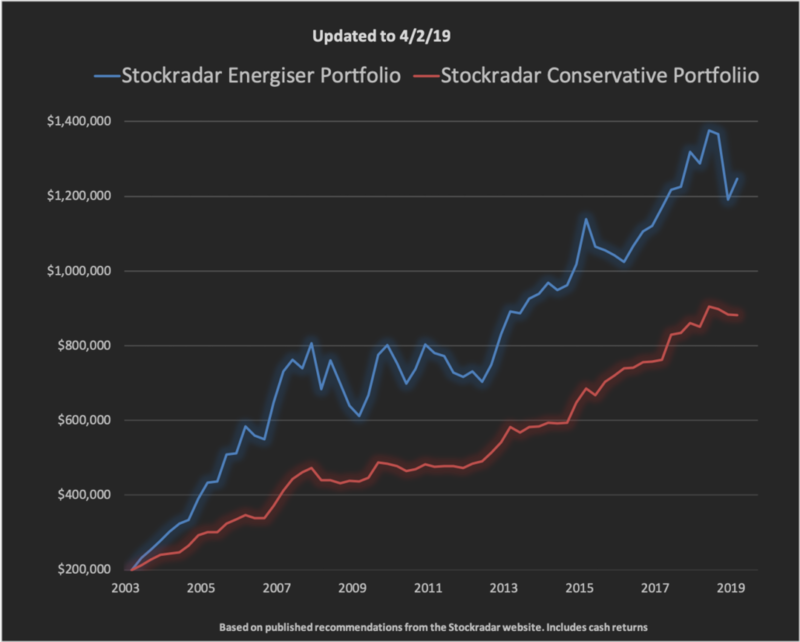 The Conservative portfolio is different from the Energiser portfolios and is based on a stock universe of 20 stocks consisting of top stocks across each Stockradar sector. The Conservative portfolio offers a simplified and very safe alternative for the risk averse investor. It has delivered an ‘safe’ 9.76% CAGR over the 16-year period. You can see clearly from the chart above how it negated the effect of the 2007/08 GFC induced crash. The Conservative portfolio holdings are a maximum of 20 stocks and the data universe is a diverse group of 20 stocks across all sectors. For example, with a capital base of $200k you allocate equal amounts across the portfolio for each of the 20 allocations. i.e. in this case $10k is the apportioned allocation. You buy a stock when you receive a signal from the Stockradar model; otherwise that portion remains in cash. This gives you a ‘binary’ portfolio of either an equity or cash component for each of the 20 allocations. This a steady performer and suits the very conservative investor who wants to know ‘where he will be’ in future years. 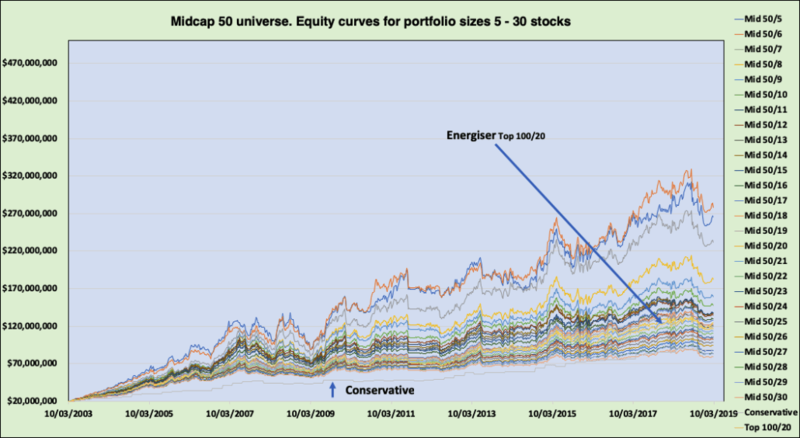 How the Energiser portfolio data universe / portfolio (stock) holding works? To understand the Energiser portfolio holdings and data universe relationship I will use the format 100/20 to describe a portfolio that uses a 100-stock universe to draw from with a maximum of 20 stocks held in the portfolio at any one time. Thus the 50/10 would describe a portfolio using a 50-stock universe with a maximum 10 stock holding at any one time. A Midcap 50/15 describes a portfolio using a 50-stock universe from the midcap capitalisation of 51 to 100 on the stock market capitalisation listings with a portfolio that will hold a maximum of 15 stocks. Once a portfolio is full a stock needs to drop out before adding again. The stock capitalisation’s are reviewed and the universe groupings (Top 100, Midcap 50) have been adjusted every six months since 2003. The data universes used by the Energiser portfolio have not been optimized to ‘data fit’ as this is perceived as an unrealistic optimization. We needed to provide a finite and unchangeable data base, based on the non-variable of market capitalisations. This is however adjusted every six-months to reflect ‘real’ market capitalisations changes as they occurred through the 16-year testing period. Placing higher ‘bets’ on a single stock than a broader diversification portfolio allows. It would be true to say that by concentrating the portfolio on fewer holding means the stop loss of one stock can have a greater overall impact on the portfolio. This is true but even when reducing the portfolio size to 5 our money management maintains risk within accepted parameters and the 20-stock portfolio has an exceptionally low risk on each trade. 10% stop on 1 stock in a 20-stock portfolio worth $200,000 = $1000. Stop = 0.5% of total portfolio value. 10% stop on 1 stock in a 5-stock portfolio worth $200,000 = $4000. Stop = 2.0% of total portfolio value. A balance must be found between the % portfolio incurred loss and number of stocks in the portfolio. The 16-year history does tell us that in the end we will be more than compensated by a larger profit offset from the winners, so we have to take the 16-year sample at face value and back the approach of conviction. A more diversified, or larger stock portfolio (10-20), can still offer good market outperforming results on a CAGR basis but only in the Top 100 and Midcap 50 data universes. This variable of portfolio size will come down to the user risk appetite. The merits of a 16-year sample are for you to decide, I simple present to you the data as it has unfolded over the years. The Stockradar process has been transparent and primarily unaltered throughput the testing period although we have more recently tightened our risk governance. It covers major periods of bull and bear market behaviour. The main takeaway from recent testing has been that smaller portfolios may focus us even more on the big winners. This places extra importance on stops and the practical implementation of the risk management process that says eliminate all big losses and run your big winners as hard as you can. The basic premise holds true of the four outcomes as we know. Stockradar’s risk management process simply cuts out number 4, Big Losses, through rigid money management rules that restrict all losses to a maximum percentage. Capital preservation being one of our primary objectives. We are then left with Big Wins, Small Wins and Small Losses and that strongly biases results towards profits. This is how the money management side, which is a separate entity from your stock picking ability, controls your share trading ‘budget’, if you like. Stops are set at predetermined levels. They provide a good balance between risk and allowing a stock to ‘breath’ or move naturally up and down within an uptrend. There probably is no perfect stop apart from one that is optimised but that sort of testing is only backward looking and is seen as inappropriate for the credibility of this development. At no stage of this development has any backward testing or optimisation been used. Because we have been testing as the process moves forward is why it has taken so many years to produce this data and documentation. In another ten years we will have more data to rely on but the current period of 16 years including both bull and bear markets is a credible testing range. We have tested a range of samples that have taken 40 different size portfolios’, 1-40, and used three different universes i.e. Top 100, Top 50 and Midcap 50. Thus, we can gain a better understanding of where the best profit generating areas lie from a portfolio size and universe perspective. Only the highest returning portfolio CAGR’s are shown below. I have discarded 1-4 portfolio sizes as results are considered outside a controlled result ‘trend’ and have left out the larger portfolio sizes 31 to 40 as the weaker performers. 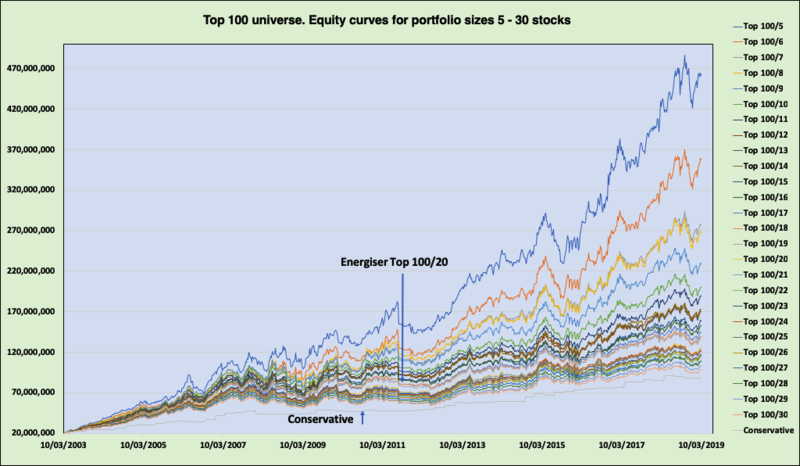 The Top 50 universe returned weaker returns than the Top 100 and Midcap 50. The highest returning portfolio above the historical average as measured by the All Ordinaries Accumulation Index average over the last 119 years of 13.1% is the 100/5 portfolio at 21.67%. There are a number of portfolios above 13.1% with most investors happy to accept anything equal to or better than 10% CAGR. The best results come from the smaller portfolios in the Top 100 and Midcap groupings. The 20 stock Energiser portfolio on the Stockradar home page gives an average CAGR of 12.11%. The Stockradar Conservative portfolio on the home page gives an average CAGR of 9.67%. The smaller portfolios require a strong conviction from the investor but the portfolio sizes from 5 to 20 all provide outperforming returns ex the Top 50 data universe. I have removed portfolio sizes 1-4 as too small and with slightly more erratic result and portfolio sizes 31 to 40 as weaker performers to focus on the best returns. The smaller the number of stocks in the portfolio, the better the results. Returns include cash returns and dividends but now allowance has been made for trading costs. These results are generated from over 16 years so that perspective needs to be respected. As we have seen during the August – December 2018 and January – March 2019 periods profits can come and go very quickly and should not be the focus as the longer-term results show. The 2018 contraction could have translated for some into a negative return year. Historical returns are based on the All Ordinaries Accumulation Index (XAOA) which includes dividends. The Australian stock market over the last 100 years has had better returns than the US market. Average Stock Market Return (US): Where Does 7% Come From? What Stock Market Return Should You Expect In the Future? Compare our results from 2003-2018 against the All Ordinaries Accumulation Index. 1. Follow a disciplined, consistent, methodical, profitable and common-sense approach.